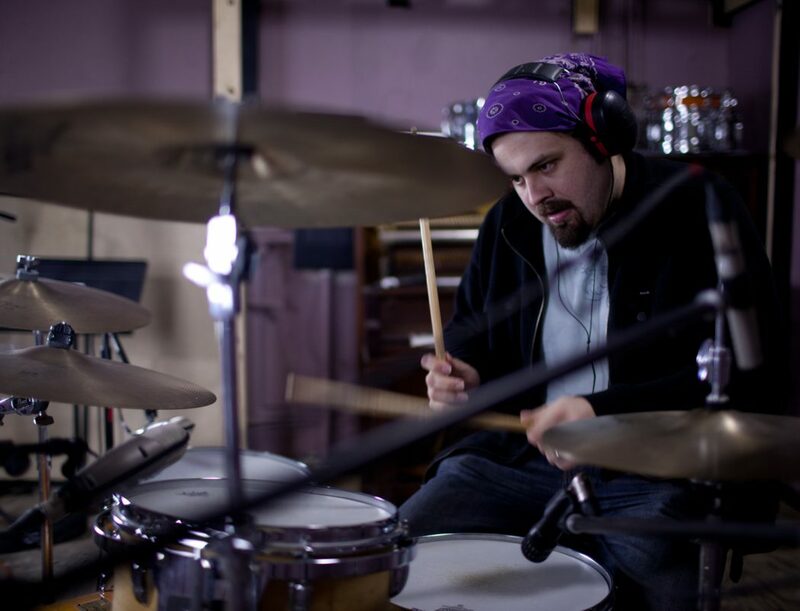 Recording your drum tracks can be one of the most challenging aspects of recording your bands music. If anything makes your music sound like a home brew, it’s because something went wrong in your drum tracks. And of course, we’ll pair each of these sections with videos. So you can hear what I’m talking about and take it all in. That’s the point…isn’t it? Let’s face it…we all have limitations. These limitations could be a selection of gear, the quality of gear, the number of microphones and inputs, or even the space that we have to record in. 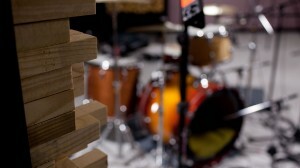 However, the modern recording mindset is to rid ourselves of limitations. Let’s take guitar amps for example…We buy guitar amp simulators so that instead of choosing one or two guitar amps from a music store, we can have hundreds of virtual amps inside of our recording software. Our recording sessions turn into virtual amp auditions instead of the focus being on a performance of whatever amp is available. With more options, there is more confusion and more to get distracted with. Too many options for a creative mind translates to very long and boring recording sessions where nothing gets done. So back to the topic of drums…even if you only have a kick and a snare, or perhaps you don’t have a kick drum, but just have a low tom…you just have to run with it and begin to form your ideas. It just so happens that if you’re running short on inputs, or microphones then you can use the foundational layer of your overhead mics as an all encompassing approach to your drum tracking. Regardless of your situation, you should know the basics of how to set up your overheads. Each approach has unique qualities and strengths. The single or “mono” overhead is the cornerstone for everything you’ll do for your drum tracks. Long story short, if you are competent at placing one microphone in a mono configuration, then you can build it with other supplemental microphones…the first of which, is a second overhead microphone in order to make a stereo recording. The placement of the mono overhead is actually a nice way to introduce the Glyn Johns method, so let’s go there now. Glyn Johns is a British engineer who is most known for his work with the Beatles. The Glyn Johns method starts with the placement of a single microphone as if it were a mono overhead. This microphone is placed 3 to 4 feet above the snare drum. 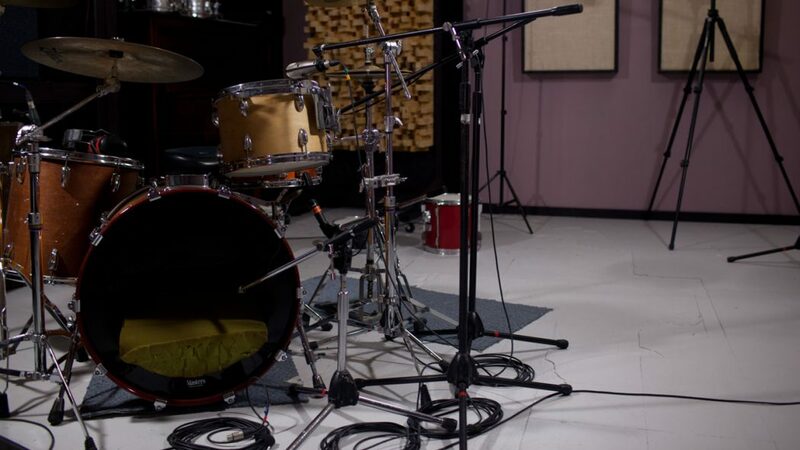 You’ll want to listen to this microphone and make sure that it’s capturing the drum set as evenly as possible. You’ll probably notice that the hi tom is louder than the low tom. Some differences are normal, but you want to watch out for toms or cymbals that are overly loud. One tip is to make a short one minute recording of this mono overhead, and listen back at a low volume. Turn the volume as low as you can and listen for things that stick out. 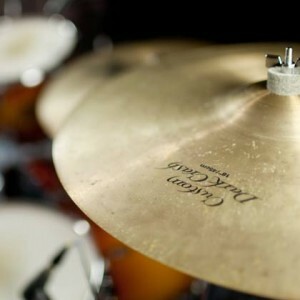 Does the crash cymbal that is closest to that microphone seem way too loud? Can you hear the snare drum clearly? A low volume can often expose elements that you may not be able to hear at louder volumes. It’s kind of like a painter taking a step back from his or her painting in order to view it from across the room. Elements of the painting become clear as the details are lost, and general balance of elements are exposed. In audio, turning the volume way down is similar to this artist view the piece from across the room. It helps keep a fresh perspective. Once you have your first mono overhead set, it’s time to add in the second microphone to achieve a stereo image of the drum set. This is where things get interesting. Instead of placing a microphone over the drummers ride cymbal (like live sound engineers typically do), we are going to place the microphone a bit lower…about shoulder height and behind the drummer. This may look funny, but in the world of sound waves, it really only matters where the microphones are pointing, and the distance of those microphones to the drums that matter. If we have the same distance to the snare drum, then these microphones will sound correct…even though they look lop-sided. You want to measure the mono overhead from the snare and then arc that distance over in order to know how far the right shoulder microphone should be from the snare drum. This takes practice when you first do it, but after you’re used to the process, it’ll become easier with time. The goal here is a few things: Capture the mono overhead for balance, and use the side mike (right shoulder) to capture other qualities of the drums such as the floor tom, kick, and ride. The drummers body will block the sound of the hi hat from reaching the side mike. This will help place the hi hat further out to one side, more so than what is actually is. This asymmetrical technique helps to capture more of the room that your recording in. This can be a bad or good thing. Need less room sound, move the mikes in closer to the drums. What about the kick and snare? The Glyn Johns method isn’t just about two overheads, but more about using four microphones to get a drum sound: Kick, Snare, OH center and OH side. Ok ok! It’s an article about overheads, I know, but this is such a classic that I had to teach you the technique. There is some debate on the specifics of the kick microphone, but you can try it on your own to see what you like. 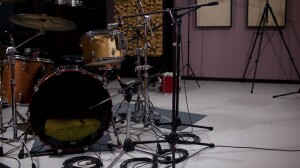 Some say that the kick microphone is also a large diaphram condenser, just like the two overheads, and it is also place equidistant from the snare drum. This means that the kick mike is also in phase with the snare drum. This would involve measuring out from the snare with the same string you used to place your side microphone. If you can’t measure the kick mike, don’t fret. It’ll still sound great if you throw a microphone up in the drum. In my experience, it can be pretty forgiving. 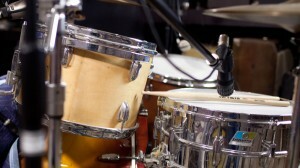 For snare, a simple dynamic mike placed near the top of the drum is often used to help boost the drum in the mix. Some use just a microphone under the snare as your overheads are providing a lot of the fullness of the snare. In my experience, I’ve found that I can get plenty of clarity of the drum that I don’t need a mike under the drum, and prefer the attack that the top microphone gives me. Unlike the Glyn Johns proven pedigree of the Beatles, the Recorderman is a new school way of thinking. Instead of just measuring from the snare to place your microphones, the Recorderman method also measures from the kick drum too. This means that you set your overhead microphone to find your balance, just like in Glyn Johns, but then when you make your measurement on that overhead, you measure from the snare to the mike, and back down to the kick to make an “A” shaped arc. This arc is moved over the drummers right shoulder and the side microphone is placed on that arc. See the video to on how I do it…it’s a little confusing at first. The great part about the Recorderman method, is that you really can get away with only using two microphones. It’s not as strong sounding as having dedicated kick and snare microphones, but both the kick and snare are in phase, and they will be the fullest sounding elements of the drum kit. One thing that is never mentioned online is the effect of microphone placement and the tones of cymbals. If you sit at the drummer’s kit and hit the cymbals, they will sound different than if you were standing over the cymbals. Cymbals radiate in a unique way. They simply aren’t omnidirectional, but tend to radiate their sound out at a diagonal direction. And just like a microphone, cymbals also have a null. They have a large null at the top (pointing at the ceiling), and a very narrow null at the edge (pointing at the drummers chest). You can use the top null as a tone shaping tool and it can be really helpful. If I want to hear less of the cymbal ring, I can arrange my overhead directly over my crash cymbals to help mellow them out. If I need more shimmer out of the cymbals, then I can move them back toward the drummers head and away from direct top of the cymbals. For rides, placing a microphone in the area that is right over the bell gives you very little sustain, and quite a lot of stick attack, which is great for a thin ride that you still want to hear the attack of the ride in a dense mix. See the video to hear how this effects the color and tone. The edge of the cymbal is the dangerous null. This null is so narrow that you don’t hear the sound of the cymbal go away unless you stoop down so that the cymbal is pointed right at your ear. You’ll noticed that the sound just vanishes. This null isn’t too much of a problem except in the Glyn Johns Method. The side microphone is often lower than usual and this puts the mike right in the dangerous area where the null will swing into the mike. So as the cymbal rocks on the cymbal stand, this side mike will hear the cymbal come in and out. Pan this with the overhead microphone and you end up having a cymbal jump across from one side to the other. A cool effect, but make sure that you really want this. There’s no fixing this effect later on. 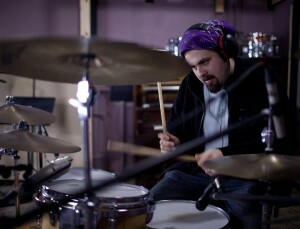 With these two methods of placing overheads, it will be a basic starting point for drum recording. We will go further in subsequent articles, but these two methods will be a excellent starting point regardless if you have two microphones or ten. Ryan Earnhardt has an online recording school, Creative Sound Lab, that teaches musicians how to use the guitars and drums they own to create recordings that they can be proud of. 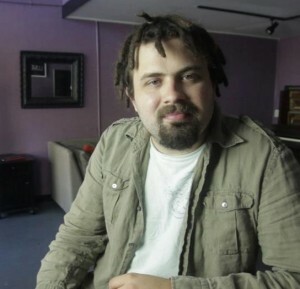 His Asheville area studio Lumen Audio acts as a host to the recording school and recording sessions. To email Ryan click here. Previous Day 30. I’m going north.